Tension in a story is a writer’s best friend. It makes readers and audiences tighten their muscles, feel twists in their stomachs, alter their breathing. It definitely keeps readers attentive and audiences in their seats. What does “tension” mean to a fiction writer? A screenwriter? A playwright? In a post by Steven James called “Three Secrets to Great Storytelling” is this definition of tension: unmet desire. I’ve added those two little words to the checklist that runs through my head as I’m writing. Things like what does my character want, what are the stakes, are the stakes high enough, and what obstacles can I put in the way to create … that unmet desire? The writer builds tension through what happens to the characters in the story, what they do and say. If well done, this leads to a feeling of suspense in the readers because, if they care about the characters, they’ll be worried about what’s happening to them next. When I think about tension, two productions come to mind: the German film Das Boot (The Boat) based on the book of the same name by Lothar-Günther Buchheim and the play Wait Until Dark by Frederick Knott, made into a film starring Audrey Hepburn. Das Boot tells the story of the crew on a German U-boat during WWII as they patrol the Atlantic and the Mediterranean Sea. Wait Until Dark is the story of a blind girl and three con men who want a doll she has. The doll has something valuable hidden in it of which the girl is unaware. What elements in these two productions helped contribute to the tension? 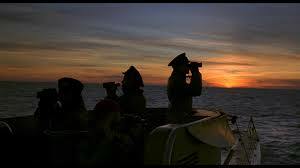 In the film, tension builds as the submarine crew pursues an enemy ship or is pursued by one. In the play tension builds as the men try to trick the blind girl into giving them the doll until she realizes something is wrong. In each situation, we have a hunter and its prey. And then the reversal of these roles. The action takes place in a single setting – the inside of a submarine and the inside of an apartment. Characters must rely on their “smarts” and their nerves within a small contained space … while becoming terrified. The characters function in darkness. The submarine crew works “in the dark” beneath the water, relying on instrumentation and sound to mount an attack or escape. The blind girl moves in real darkness. Both use foreshadowing. The audience sees what the fate of a submarine can be if it becomes a target or experiences equipment failure. Early in the play we learn the girl has a fear of fire. Later, fire is an integral part of the story’s conclusion. The crunch of time builds tension. The submarine crew has only so much time before detection or escape. The girl has only so much time before the con men will play a final and lethal card. The stories build through rising action as the characters seek what they are after. The action is cranked up, dropped back for a moment (giving audiences or readers a moment of down time), and then cranked up again … higher. What the characters want is very clear and the stakes are high, as given in the examples. However, what characters want and high stakes are in every good story, whether it’s a literal life and death situation or not. Will the fellow get the girl? Will the team win? Will a woman find her biological child given up for adoption at birth? My last point is this. I cared about the crew, of what happened to men living in close quarters under high pressure. I cared about the blind girl and what happened to her at the hands of three con men. The writers touched my empathy button. We have to care. A writer can create tension in a number of ways, such as with a hunter and prey, a small enclosed setting, darkness, foreshadowing, time running out, intensified action, clear character goals, high stakes, and characters we care about. If you haven’t read or seen Das Boot or Wait Until Dark, put them on your list. You’ll have a tension-filled good time! This entry was posted in Authors, fiction writing, novel, Reading, short story, Writing and tagged Audrey Hepburn, characters, Das Boot, film, Frederick Knott, Lothar-Gunther Buchheim, plays, playwright, screenwriter, storytelling, suspense, tension, The Boat, Theatre, Wait Until Dark, writer. Bookmark the permalink. 6 Responses to Make it Tense! Very well said Carol, love your examples. Good advice. Thanks, Susan. “Wait Until Dark” is a difficult play to do. The timing has to be just right for the tension to keep building higher. The productions I’ve seen have had some great moments, but …. I wish someone would do a new film version. I remember my husband Mark suggesting to me to read, The Eye of The World by Robert Jordan; the story became so tense I realized I wasn’t breathing. I really enjoyed that book and need to find the rest of the series. I would like to read Das Boot now, besides watching the film. Thank you for your great suggestions. I will have to read The Eye of the World. I like that kind of tension! As I left the theater after seeing Das Boot, I felt exhausted. It’s a classic. Thank you, Denis. Glad you stopped by and found something of interest.